Configuration editor for the Enhanced UNIX Amiga Emulator. Is there a better alternative to Hi-Toro? Is Hi-Toro really the best app in System category? 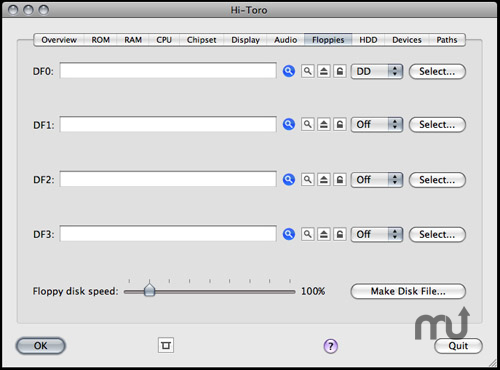 Will Hi-Toro work good on macOS 10.13.4? Hi-Toro is a Mac OS X configuration editor for E-UAE, the Enhanced UNIX Amiga Emulator. It provides an Aqua graphical user interface for you to make, open, save, modify, and run configurations, including configurations imported from WinUAE, or other UNIX variants of the emulator. Version 0.5.2: Release notes were unavailable when this listing was updated. Hi-Toro needs a review. Be the first to review this app and get the discussion started! Hi-Toro needs a rating. Be the first to rate this app and get the discussion started!